Supports smooth skin, menstrual balance, relaxes PMS. 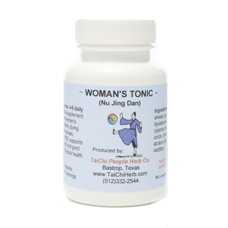 Woman’s Tonic strengthens female energy, harmonizes menstrual cycle, relaxes premenstrual tensions (PMS), supports hormone balance, good mental & physical health, and smooth skin. Ingredients: angelica sinesis, moutan cortex, paeonia radix, ligusticum radix, halloysitum rebrum, corydalis rhizome, commiphora myrrha, aquilaria resin, atractylodes rhizome, ginseng radix, cynanchum radix, cinnamomum ramulus, poria cocos, cyperus rotundus. Size: 100 capsules per bottle. Produced by TaiChi People Herb Co, LLC in USA.